Two Appartments "A" and "B"
in a completely reconstructed and refurbished historical house originally built in 1890. 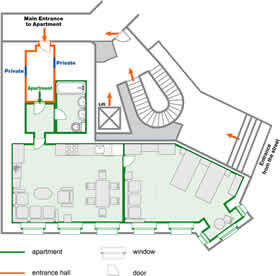 The modern character of the reconstruction enables an easy access to the apartment, suitable also for the handicapped. Be different in your choice of place to stay! Style: cosy, Czech home flavoured apartment - a home away from home! Location: be smart, you do not have to be in the overcrowded town center !!! 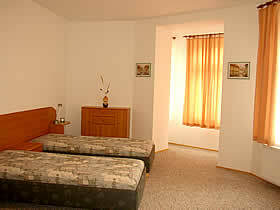 The facility is new, furnished and maintained in the European standard style. The lower comfort - max.capacity should be considered only in exeptional cases and is not recommended. TV set with a satellite receiver, radio-CD-cassette player, and an alarm clock. The kitchenette is equipped with an electric stove, dishwasher, microwave, toaster, electric kettle, coffee maker, fridge with a freezer. Dishes, cutlery, drying cloths and detergents are provided. A hair dryer, pressing machine and pressing board are also available. • No pets are allowed in the apartments. • Key deposit per set of keys, in the amount equal to the price of one night per apartment, is charged upon arrival. As it is paid back to you on departure, for your convenience it can be paid in EUR or in your local currency. • Your accommodation offers you high level of privacy and comfort as the house is residential and home to Czech and foreign families. We expect considerate behaviour, especially after 10:00 pm. • We would like to ask you to refrain from smoking in the bedroom at all times.